A to Z rookie. Yep, that’s me. So you’ve got to be asking yourself…how can someone who’s never been through a month of April blogging every day, write a survival guide? And an even better question, why should I pay attention to anything he has to say? Both very good questions, so let me answer them for you. First, I don’t live under a blogging rock. Even though I haven’t participated for the past two years, I did follow along and read a ton of posts. I know what I liked, what worked, and consequently what didn’t. Second, you know what I spent a good many years doing for my job in the real world? Planning and scheduling! Third, you know what else I used to do in the real world? I wrote instruction manuals and trained new employees about the stuff in those manuals. And finally, I’m motivated. I have two goals for this post…to encourage somebody who’s not signed up yet to do just that…and to reassure those of you out there who are nervous about committing to what seems like a massive task and show you how easy it can really be. You can do this! To make it all the way to April 30th with your sanity intact, you’ll need a survival kit. I’ll show you a couple thing’s to place in that kit, but I’m sure they’ll be plenty more recommendations offered in the comments below. Pick and choose what makes sense to you. Next item to put in your survival kit, instructions on how to utilize the scheduling feature on your blog. Posting every day doesn’t have to mean writing every day. There are six weeks until April gets here and if you wrote and scheduled two posts a week until then, you would have 12 of the 26 letters/days covered before the month even begins. Start today…right now as a matter of fact…stop reading this post and write one of your post for the Challenge. Planning ahead will save you a lot of anxious moments. So you’re more of a pantser than a plotter, and no matter how many good intentions you had when April 1 arrives you haven’t written a single post yet. No problem, time to pull out that next item from your survival kit. A tea spoon. I know how standing at the doorstep of April contemplating blogging every single day can appear daunting, overwhelming. The key is to not concentrate of the whole and instead break it down into pieces, small bites. 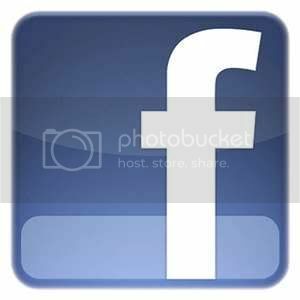 Take it one.post.at.a.time! If you find some extra time to punch out a couple posts ahead of time, great, but don’t sweat it if you can’t. Just worry about today’s bite! And remember that BREVITY card? Small bites! What else should be in your survival kit? 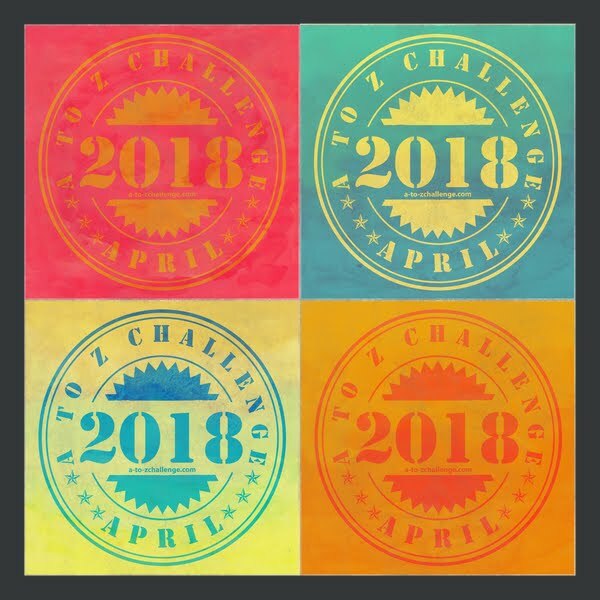 Definitely something like a playlist for your MP3 player customized for the A to Z Challenge, or some of your favorite CD’s, maybe some type of aroma therapy or your favorite exotic coffee. This is not intended to be a stressful event, and if you utilize some of the items in this survival kit you’ll avoid most of that, but still there are some participants that do get a little tense. To combat this I recommend you utilize the items in your kit that best help you find a sense of tranquility that will help you through those times. Remember, we want this to be FUN above everything else! Last, but not least, duct tape. Every self-respecting survival kit includes duct tape! I hope I’ve helped some. I’m here, along with all of the co-hosts, to see that you have an enjoyable experience. A survival kit filled with at least those five things will take you a long way to surviving April in one piece, but it’s only a start. If you have a suggestion for something else that needs to find its way into that kit, just leave a comment below. excitement builds. this is going to be great... and nice solid post. Hi, DL! This is the best A-Z survival kit on the market for sure. :) Can't believe how fast April is arriving! And duct tape is the answer for everything. Brevity - yeah right,you know me. You didn't tell me what to do with the duct tape, but then maybe I don't want to know. Great thoughts, DL. And yes, brevity is so important. Lots of excellent advice. I think after brevity, the most important thing is a theme. Combine theme with a letter of the alphabet, and keep your post under 100 words, and the posts will practically write themselves. I have a calendar where I plan on my guests, hops, topics, etc. related to my blog. I've got my alphabet planning started and noted on each date. Brevity? I can be good at that one. :) Great post. Thank you for this survival kit. I need all of the tips I can get. This April will be my first blogging challenge. I'm anxious and excited! Thanks! These tips will help a lot! Retro ~ And builds...and builds! Gossip_Grl ~ Your most welcome! Alex ~ And now that they have colored duct tape...I'm in seventh heaven! Brinda ~ I knew you would be organized! Ro ~ It's gonna be a blast! Glad you're on-board. Akkkkkk!!! I've tried to resist, really I have. I certainly don't need another 'gotta do,' especially one that lasts a whole freakin' month! "Come! Join us! Be part of us! 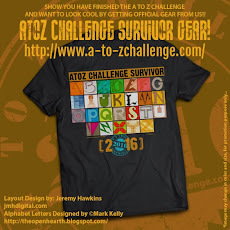 Embrace the A-to-Z blogging collective! Auugghhh!! I surrender! God Help me, I'll do it!!! This is all YOUR fault!!!! This will be my first blog challenge too! I'm pretty new to blogging but am excited for this challenge. thanks for the advice! hahaha you make it sound stressful! LISTEN TO THIS MAN PEOPLE! He's right on the mark here. Great post. Any kit that includes duct tape is a winner in my book. Brevity is definitely gonna be the biggest challenge for me, but I'm working on it. Oh, and you left something out of your kit. Duct tape only fixes SOME problems; for the rest, you need WD-40. Ok, I don't know if it's my guilt from being such a bad blogger lately or if it's your overwhelmingly convincing advice, but I'm feeling crazy and AM going to sign up. Good advice. I especially like having 'permission' to be brief! It's my first time doing the A-Z and I must admit I had been thinking more about what I was going to write than allowing myself plenty of time to look at other blogs- even though I have already learned a whole lot of helpful stuff by following the 'lead up' posts to the event. This rocks, DL. EXCELLENT advice. I made my brevity card and it's on display, clothes-pinned to my mac. I didn't write my A post yet...but I already know what it is, so I feel like I could crank it out fairly quickly. It's been such fun already, all of us working together to make this event happen. Go team A-Z 2012! Keep it brief, keep it brief, keep it brief (that's so hard for me to do, but I will). Keep it brief and they will come. Thanks for the great tips DL! I keep meaning to start writing some post, but I haven't yet. I like Matthew's idea of a common theme. Although, it would be nice if they worte themselves. I guess it's me and a dictionary this weekend. More great suggestions. I'm ready except for the duct tape. I got my backpack loaded! This is all such great advice. Thank you, DL! Thank you so much for mentioning brevity. I've participated in other blogfests, and when I see a post that's paragraph after paragraph, I shake my head and look for another blog. 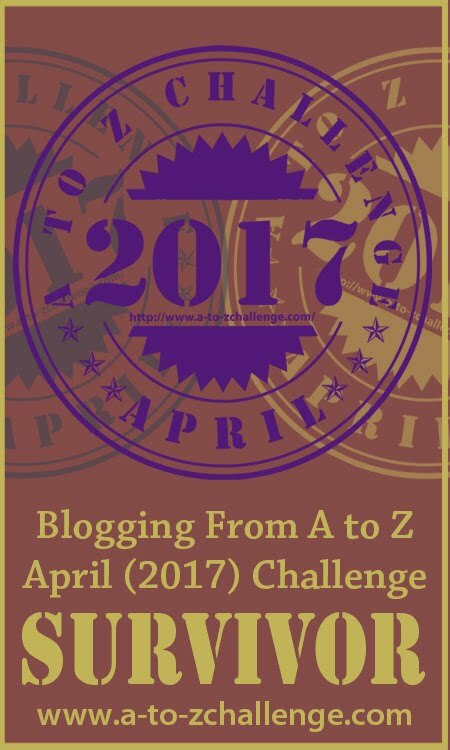 Oh gosh, not sure I contain myself with the incredible thrill of the next A to Z Blogging Challenge! Fantastic that you are bringing, yet again, further awareness of the alphabet! Good luck, rookie. 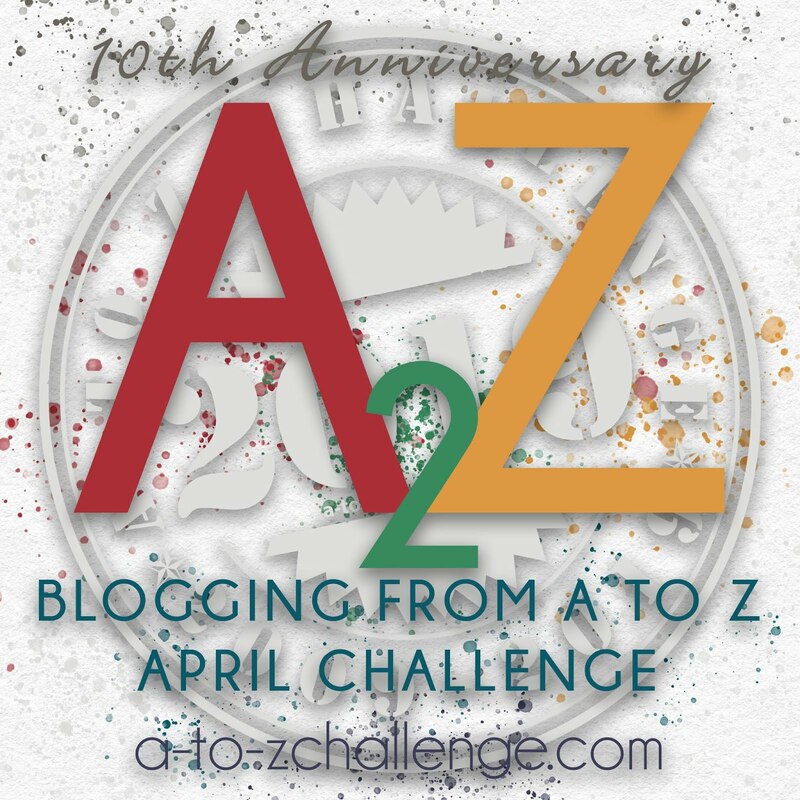 I can hardly wait for April and do some of my eagerly awaited, to the point of euphoric ecstasy, alternative, satire blogs do this gosh, darn fun, A to Z Challenge. Okay, seriously, have fun and happy writing :) Now then, let me think, A is for Again. 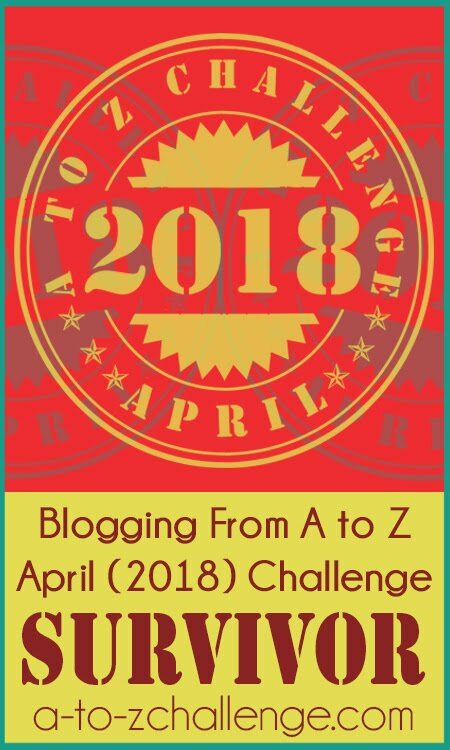 The A to Z Challenge is here again! Um enough BREVITY in my comment? Yes? No? You don't care? Short and sweet...leave them wanting. Hey DL, so I finally got a chance to check out this post. NICE! Great post! I'm ready for April. The note card idea - brilliant! Totally doing this! Thanks for the kit ideas. Hehehe! Great survival tips. This is my first time doing the Challenge. My tactic to keep my sanity is doing the posts before April. I've done all the way through J so far. That way I can spend my time in April just visiting other participants which is the biggest part of the fun for me. Mina -- Love the 26 uses for duct tape A to Z. Now I want to see that one. Klahanie --Have you officially signed up on the list yet? You really should you know. Your posts have become an A to Zed tradition. No reason why you can't have 26 official satirical posts. You know you want to. And your fans are waiting for you. jnana ~ Only for a small percentage. Preparation cures all ills.! Arlee ~ I learned from the best! Marcy ~ Great job! One down, at least a few more to go! Ebby ~ You have my permission...and then some! Tina ~ We have such an awesome team! There's not much we can't accomplish! Debra ~ I hope it helped. Thank you! Marta ~ Keep it brief and they will come. I LOVE IT! Jessica ~ I checked this morning to see if any had written themselves. Nope. Dang it! klahanie ~ Sounds like you're biting at the bit! Danielle ~ I'm glad you like my idea. I'm visual that way! Christine ~ That sounds like a great plan!! I'm going to link to this post over at my place. I talked a couple blog friends into joining and I can tell they're starting to freak out. Great advice! Keep it brief and keep it fun. This is a fun challenge, not something that should be taken so seriously that it's not enjoyable anymore. what a great post! I loved everything about this guy! Duct tape is like the force.. It has a light side and a dark side and it hold tg universe together . This is my second year and this time I have a notes page on my iPhone with letters a-z listed. Every time I thing of a topic for a letter it gets noted down. Hopefully even if I have no posts written I will at least have 26 topics by the time April arrives. Well I almost had an idea, but Mina thought of it already. I thought I would be so clever blogging on uses of duct tape beginning with each letter. Shows you how warped my brain is right now. I am guessing everyone who read this before me already considered that. Thanks for the survival tips. No offense to anyone, but I am adding wine and lots of it to my kit. I quit smoking with my husband after his last heart scare so there is no way I can sneak a smoke into my survival kit. What a month to quit. I feel better after reading all of the helpful post. Donna McNicol has an excellent one as well (she plugs yours) . Anyone who has not read it should check it out. The only thing I am still freaking out about is whether or not I have to have a theme and what it will be. So the big tip is brevity. As you can tell from the length of this comment-I will have to work on some major restraint. Great post! The weird thing is I have all these items within a few feet of me. Including the duct tape, courtesy of my DH. April is coming. Survival kits are to be opened. Shall remember Brevity. Making A to Z Challenge More... Friendly! Get Yourself a Theme Song! Banners and Badges... What Would you like to See?